to go back to living in the bush and I am not sure if I will have any access to the internet, so I want to post what pictures I have which I think might be of interest. The irony is that then I will be finding all the good critters but have no where to post them. Oh well, I guess it is a case of getting my priorities right, and in the bush, I will have my stars, crickets and frogs at night again, which is more important to me than posting pictures. 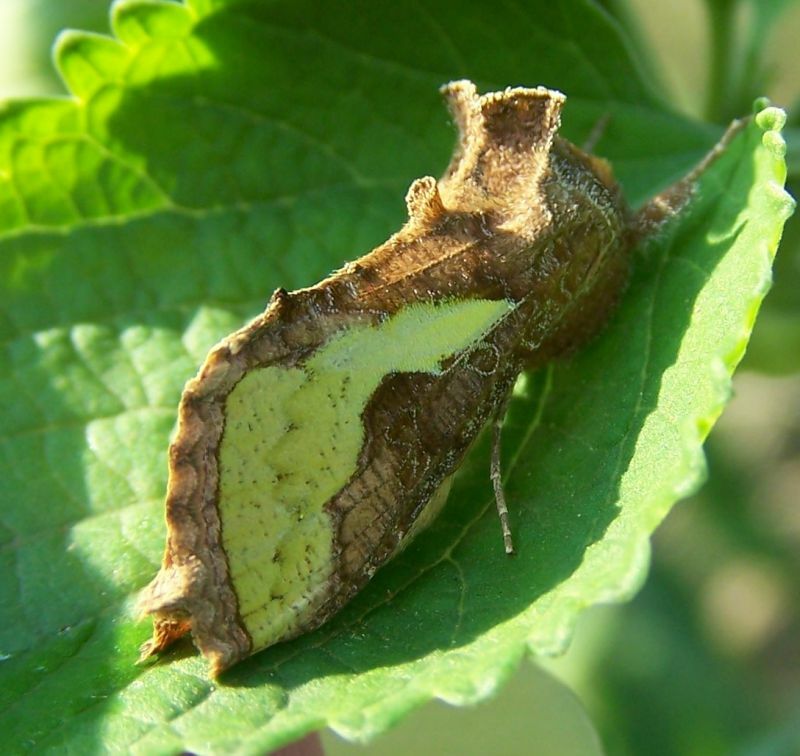 This a Golden Plusia Moth. Its larval foodplants include beans, sunflowers, most legumes, lettuce etc. I had a picture of the caterpillar, but cannot find the disc which it is on, but it is a pretty uninteresting plain green colour. Sounds like an adventure Joan; I can almost hear the sound track. Thanks Craig, I am really looking forward to it after being stuck in "civilization" for two years. Sounds like quite an adventure!!! I'd like to say I envy you, but I suspect the hardships and missing creature comforts most of us softies are used to would make me not envy you if I knew the full facts! I hope you will tell us more about what you'll be doing before you go, and make it back to an internet connection and post some shots and tell some stories here once in awhile! Thanks for your nice comment Mike. During the 20 years I lived there previously, the only thing I missed was a slice of pizza on occasions!! sorry to hear ya go joan, have fun and hope it all works out. nice pic btw. You need a satellite link Joan, same as the press men have for sending back pictures and stories from the wilds! Failing that make a CD of your messages and pictures and post it to a friend with a computer connection in civilisation to forward for you. Sort of a monthly report from our rural correspondent! Thanks for the kind words Jordan. These are beautiful moths. Sort of a monthly report from our rural correspondent! What a great idea Dave!! I will see what I can do, but maybe when I get there I might find my wireless connection works although the distribution map shows that I will be out of the area. Please tell us you are at least taking your camera, a solar charger and a whole tonne of compact flash cards!! Thanks Laurie. I never go anywhere without my camera. At least there is electricity there so I can recharge the batteries and load the pics onto the computer. Happy journey and good luck Joan.